Flash U.S. Composite Output Index at 54.8 (53.9 in September). 3-month high. Flash U.S. Services Business Activity Index at 54.7 (53.5 in September). 2-month high. Flash U.S. Manufacturing PMI at 55.9 (55.6 in September). 5-month high. Services - Meanwhile, input cost inflation accelerated to its sharpest since September 2013. A number of panel members cited the pass through of tariffs, alongside rising fuel bills and higher borrowing costs. 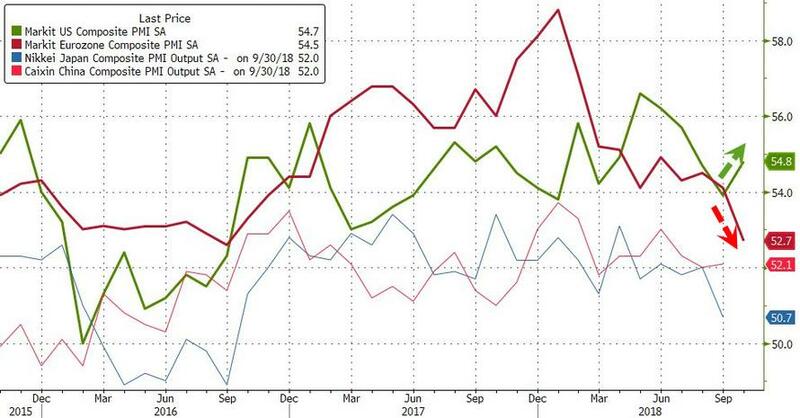 Manufacturing - Input cost inflation reached a five-month high in October, which was widely linked to metals tariffs and higher oil-related prices. At the same time, factory gate charges continued to increase at one of the fastest rates since the first half of 2011. “The flash PMI surveys indicate that the pace of economic growth gained momentum again in October after having been subdued mainly by adverse weather in September. The headline PMI is running at a level broadly consistent with the economy growing at an annualised rate of 2.5%, boding well for another robust quarter of growth. “The survey still suggests, however, that growth is being constrained by a lack of capacity, with skill shortages widely reported and supplier delays remaining commonplace. Companies consequently reported yet another rise in backlogs of work as, measured overall, order book inflows once again exceeded output growth. “The domestic economy remained the main driver of demand, with exports stagnating amid growing signs of trade being subdued by tariffs. 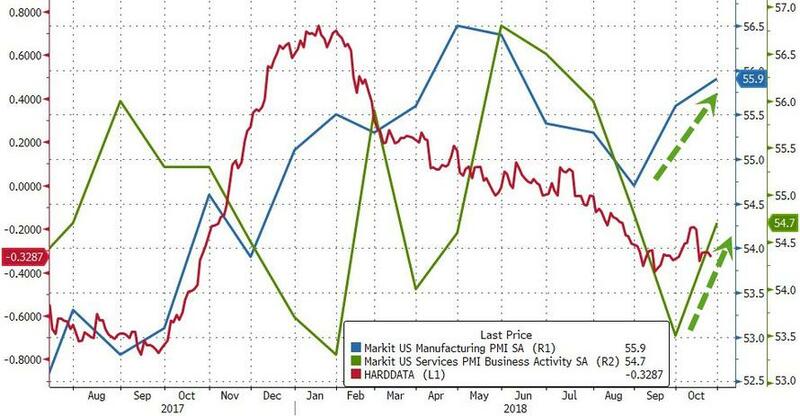 “Tariffs also drove a further marked rise in prices, exacerbating an upward trend in price pressures borne out of robust domestic demand. Average prices charged for goods rose at one of the fastest rates seen over the past seven years while average charges for services showed the second-largest rise since the global financial crisis.